Alma Thomas (1891-1978), the nationally acclaimed abstract artist, lived in this house from 1907 until her death. In 1924 she became the first graduate of Howard University's Art Department — and possibly the first black woman in the country to earn a fine arts degree. Besides teaching art at Shaw Junior High School for 35 years, Thomas was active in the city's art community particularly the Washington Color School and, with Lois Mailou Jones and the Barnett Aden Gallery, "The Little Paris Studio." Thomas's painting are part of the permanent collections of the Hirshhorn Museum, National Museum of Women in the Arts, National Gallery of Art, and others. Location. 38° 54.637′ N, 77° 2.077′ W. Marker is in Dupont Circle, District of Columbia, in Washington. Marker is on 15th Street Northwest north of Church Street Northwest, on the left when traveling north. Touch for map. 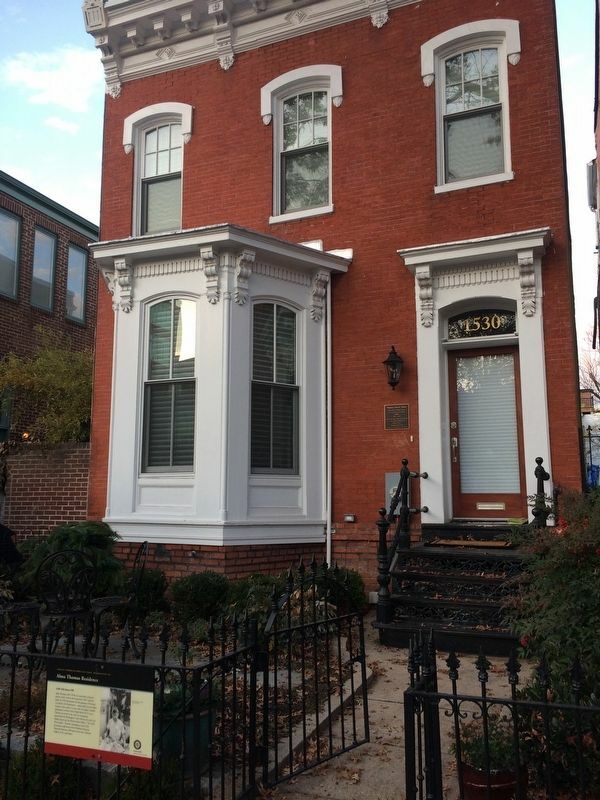 Marker is at or near this postal address: 1530 15th Street Northwest, Washington DC 20005, United States of America. Touch for directions. Other nearby markers. At least 8 other markers are within walking distance of this marker. Thomas Family Home (here, next to this marker); Advancing the Race (within shouting distance of this marker); St. Luke's Episcopal Church/Alexander Crummel (within shouting distance of this marker); The Dupont Circle area has always been (about 400 feet away, measured in a direct line); The Stonesdale (about 500 feet away); See You at the Center (about 500 feet away); Administration Building, Carnegie Institution of Washington (about 600 feet away); Theodore Roosevelt Worshiped Here Regularly (about 600 feet away). Touch for a list and map of all markers in Dupont Circle. More. 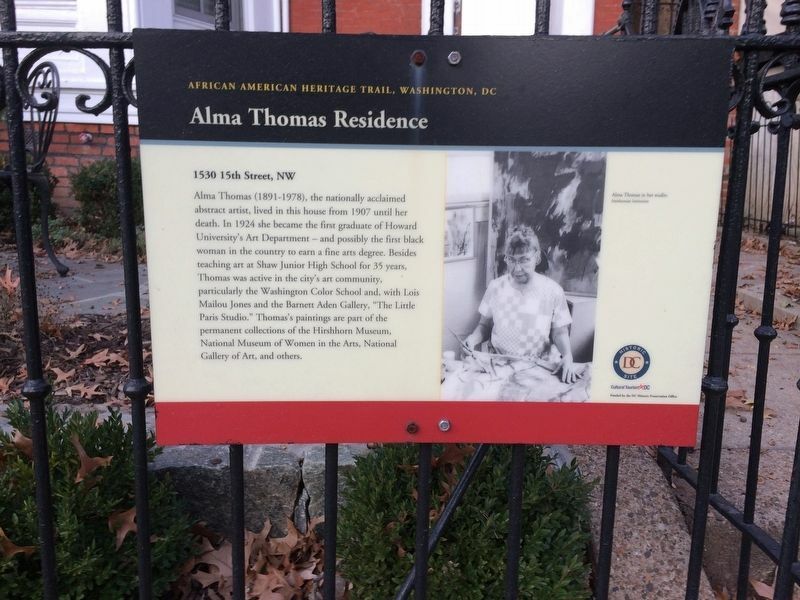 Search the internet for Alma Thomas Residence. Credits. This page was last revised on March 11, 2019. This page originally submitted on December 2, 2017, by Devry Becker Jones of Washington, District of Columbia. This page has been viewed 109 times since then and 15 times this year. Photos: 1, 2. submitted on December 2, 2017, by Devry Becker Jones of Washington, District of Columbia. • Bill Pfingsten was the editor who published this page.